We've been covering Monster Jam for years and the kids can't wait for the trucks to roar into town every winter. Grab your ear protection and bandanas for the dust and check it out! ChiIL Mama's giving away a family 4 pack of tickets to opening night 7:30 p.m., Friday, Feb. 17 to one of our lucky readers. Enter at the bottom of this post through midnight Saturday 2/11 for your shot at winning. We're thrilled to partner up with Monster Jam and FELD yet again this year to offer a great giveaway. Click HERE and scroll down for loads of our original past Monster Truck videos and photo recaps, then get out and GO already, for tons of thrills and spills. What are you waiting for?! You've got to see it to believe it. The most adrenaline charged motorsports experience on the planet roars into Chicago. The battle commences with customized, high-powered vehicles including Monster Jam Speedsters, Monster Jam ATVs and the famous Monster Jam trucks clashing it out. Watch your favorite Monster Jam trucks and drivers go head-to-head in a competitive format that is sure to keep fans on the edge of their seat. Monster Jam®, the most adrenaline charged motorsports experience on the planet, will roar into the Allstate Arena in Rosemont, Ill., Feb. 17-20, for six action-packed shows. A perennial sell-out here, Monster Jam is celebrating 25 years of family entertainment during 2017. Among three different Monster Jam tours scheduled to travel a combined 60,000 miles across the United States and Canada this year, the Monster Jam Triple Threat Series presented by AMSOIL can only be seen in select cities and features the most extreme athletes of Monster Jam. Chicago-area fans will witness a fierce battle for the championship with each competitor using customized high-powered vehicles: Monster Jam Speedsters, Monster Jam ATVs and the famous Monster Jam trucks. The premier athletes vying to be Chicago champion are slated to be: 19-year-old Krysten Anderson, daughter of Monster Jam legend Dennis Anderson, driving the best-known Monster Jam truck of all time, the truck her father created in 1982, Grave Digger; Armando Castro driving crowd-favorite El Toro Loco; 20-year-old Camden Murphy from Itasca, Ill., driving Pirate’s Curse; Justin Sipes driving Megalodon; Bernard Light driving Alien Invasion; Ami Houde driving one of the sport’s most distinctive Monster Jam trucks, Zombie; JR Seasock driving the popular Monster Mutt Rottweiler, and Matt Cody driving Blue Thunder. Trucks and drivers are subject to change. 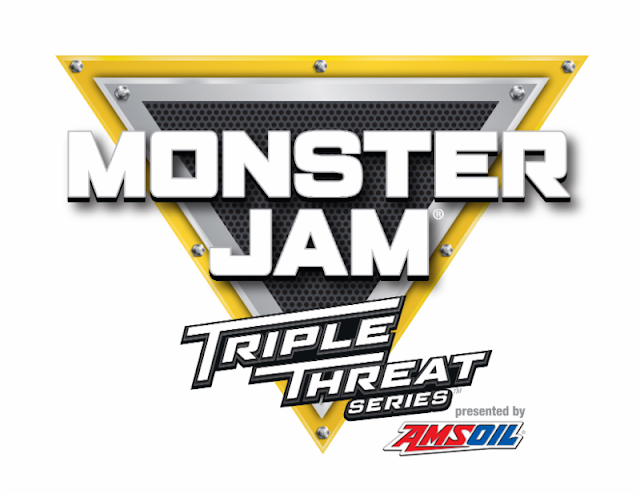 Show dates and times for Monster Jam Triple Threat Series presented by AMSOIL at the Allstate Arena are: 7:30 p.m., Friday, Feb. 17; 1 p.m. and 7 p.m., Saturday, Feb. 18; 1 p.m. and 6:30 p.m., Sunday, Feb. 19, and 1 p.m. on President’s Day Monday, Feb. 20. 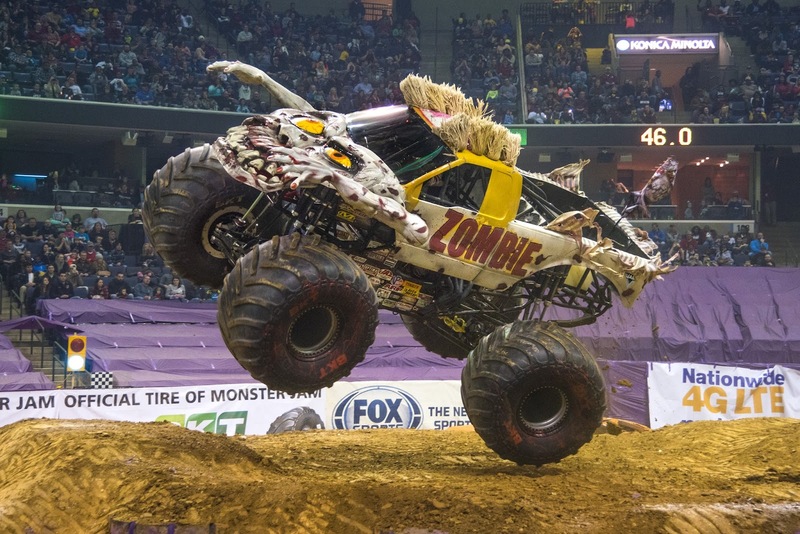 Monster Jam events are affordably priced for the whole family with seats starting at $22. Tickets are available at ticketmaster.com and all Ticketmaster retail locations, the Allstate Arena box office, and by phone at (800) 745-3000. Pit Parties on Saturday and Sunday from 10:30 a.m. to Noon give fans the opportunity to meet the Monster Jam athletes and get up close to the Monster Jam trucks. Pit passes are $10 and can only be purchased in conjunction with tickets to the same-day Saturday or Sunday 1 p.m. show. ChiIL Mama's giving away a family 4 pack of tickets to opening night 7:30 p.m., Friday, Feb. 17 to one of our lucky readers. ENTER HERE through midnight Saturday 2/11 for your shot at winning. Disclosure: ChiIL Mama is thrilled to partner up with Monster Jam and FELD yet again this year to offer a great giveaway. We have been compensated with tickets for my family for review purposes and tickets to give away as well. As always, all opinions are my own.